The Marketing sector is volatile and used to trends, but which trends should marketers pay attention to? The marketing world is no stranger to trends, and with technology consistently providing an increasing array of options, marketers need to understand what trends are worth investing in. To discover which areas of marketing our professionals foresee as game changers, we decided to ask them. Interactive content is becoming an increasingly popular tool to educate, engage, and entertain customers. Content is still a very effective form of marketing, but in a world where your customers spend a considerable amount of time on social media platforms, truly engaging content is no longer merely to be stared at. Interactive content changes the dynamic of your relationship to a two-way conversation that enables you to provide a more personalized and focused experience. Marketing automation has the potential to take the ever-growing load off marketers’ shoulders. With the plethora of digital channels available and a recent resurgence of email marketing, the need to be targeted, analyze results, and respond promptly, all become more vital to your campaign’s success. Marketing automation is dealing with increasingly complex repetitive tasks and in doing so is generating more leads, taking action driven by data analysis, and dealing with post-sale activities. Many of the apps we use every day are already designed to be used vertically, so when Instagram introduced the story feature with a vertical layout, users were quick to adopt this mode of viewing. A study on mobile phone usage shows they’re held upright for over 90% of the time they are in use, so vertical content feels much more natural for users. Facebook even recently announced at their F8 Conference that stories is on the way to replacing the news feed as the primary way people share their media, making vertical the preferred option by many people, and therefore, the best way for marketers to communicate on a mobile device. 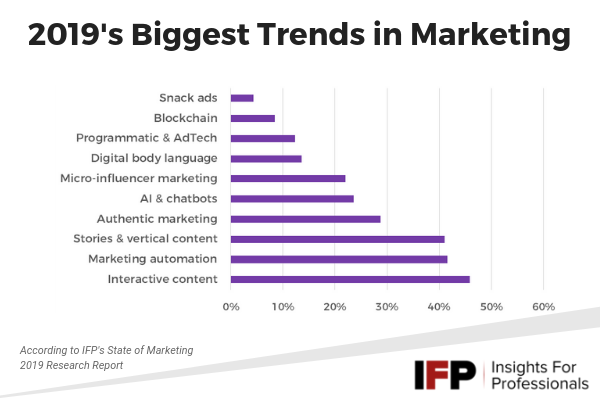 After years of consistently being force fed a diet of advertising in the digital space, marketers are turning to more holistic methods of getting their brand out there. They are trying to add value to their customers in more authentic ways, so they are not an intruding force, but a welcome participant in the customer’s digital world. When performed successfully, this approach changes the mind-set of your customer base. The ‘us and them’ becomes ‘they’re one of us’. Trying to help your customers achieve their goals can add genuine value to their experience of your brand, which often leads to organic growth. Advancements in AI have taken chatbots to a completely new level. We’re rapidly approaching a time where distinguishing between a human or AI response will be virtually impossible. Companies are starting to use NLP (Natural Language Processing) combined with machine learning algorithms to handle many customer service and social media responses. The potential cost savings for businesses, and faster service for customers, both make the use of AI powered chatbots a viable option for most companies. People influence people. It really is that simple. To tie in with the increasing search for authenticity, micro-influencer marketing doesn’t rely on global superstars to promote your brand, as these are often obviously paid sponsorships. Instead, micro-influencers have a smaller following with higher levels of engagement and rely on more authentic marketing methods by being active in all the right places to help spread your message to your target audience. Digital body language is the natural extension of the increased interest in CX (Customer experience). Tracking a user’s digital body language and making your customer experience reactive can increase engagement with your customers in real time through accurate personalization. Changes in our mood and needs change our perception of the service we receive, and a reactive digital body language that adapts in real-time will be the future of always meeting a customer’s expectations. The algorithms used in programmatic AdTech allow online advertisers to target their ads even more precisely. In a world where ad space is constantly trying to predict our needs, programmatic AdTech uses a range of defined criteria to ensure the ads purchased provide the maximum amount of bang for your buck. Once everything is set up correctly the whole process is automated, allowing you to leave the algorithms to do their job while you concentrate on other tasks. Although originally developed as a decentralized tool for Bitcoin transactions, the speed and versatility of blockchain have piqued the interest of other sectors. It has the potential to simplify business operations while providing greater transparency, cost efficiency, and accuracy. However, there are still some concerns regarding the overall security of a decentralized system, but with demand rapidly growing for blockchain solutions, these regulatory hurdles are likely to be addressed sooner rather than later. The digital world has changed the way we consume information. From your Instagram feed to Twitter, we now receive information and interact in bite size chunks. Marketers and companies have been playing with different ways to feed us information and engage us in increasingly shorter but meaningful ways. YouTube has introduced 6-second ads, which represents a considerable reduction over the more traditional ads with the option to skip after 5-seconds. Creating content specifically with snack ads in mind can help to ensure your whole message is seen with the minimum amount of intrusion.